Both are false, but when you hear something repeated over and over again you begin to assimilate it as a fact. We now know the earth is round and it's skim milk -- not whole milk -- that makes you round-er. I won't get into the geography earth thing right now, but needless to say Columbus and his men did not fall off the edge of the planet as predicted back in 1492. But when it comes to milk, the news that nutritionists were wrong about nixing whole milk from our diets has been slower to surface in popular culture. Even the school lunch program, run by the federal government, serves only reduced- and non-fat fat milk for children based on the mistaken notion that consuming less fat will make America's children less fat. Sure it sounds intuitive. Just like looking at a horizon and assuming you will fall off the edge of the earth. But things are not always as they seem. "We found that a low intake of dairy fat was associated with a higher risk of developing central obesity and that a high intake of dairy fat was associated with a lower risk of central obesity among men without central obesity at baseline," concluded Swedish researcher Sara Holmberg. Meanwhile, The Salt reported last year on several studies of American children suggesting consumption of lower- or non-fat milks was not associated with lower body weight. One study found, "the relationship between skim-milk drinkers and higher body weights held up across all racial/ethnic and socioeconomic groups," surprising the researchers who hypothesized the opposite. What scientists and doctors had "logically" deduced was that consuming less saturated fat would result in leaner bodies. But they forgot about the Law of Unintended Consequences. Fat provides satiety, and drinking skim milk is not very satisfying. So children and adults are more likely to keep eating to feel full. In other words, they compensate by consuming extra calories of less nutritious foods, according to the five-star general of nutritionists, Dr. Walter Willett, who chairs the department of nutrition and epidemiology at Harvard School of Public Health. There are flaws and limitations to virtually every study, but anyone who is in touch with the effect of food on their body can feel the difference in satiety when drinking whole vs skim milk a.k.a. white water. 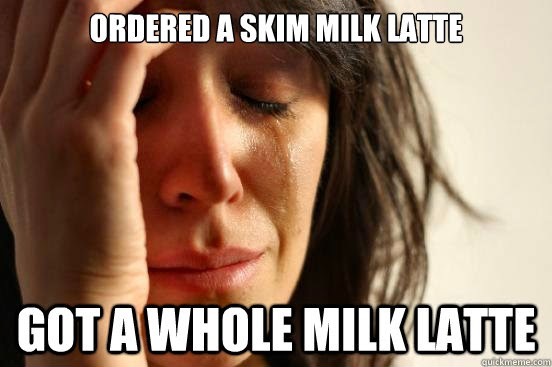 Turns out skim milk is as fake as the designer knock off that pretends to be as good or better than the real thing. Is Diet the New Religion?